Checking fire alarms once monthly and changing the batteries at least annually. Making sure fireplaces and wood stoves are in proper working order. If there are smokers in the home, making sure cigarettes are put completely out. Planning escape routes and then practicing them. Knowing what type of fire extinguisher should be in a home. Teaching kids fire safety rules such as not playing with matches. California is a hot spot for one major reason - forest fires. It's estimated that a good bulk of forest fires that occur each year are in California and other western states. 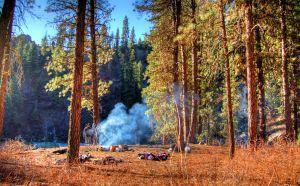 Dry areas of The Golden State are especially vulnerable to forest fires. The next piece of the puzzle is that California is a state with a huge population. Homes are everywhere in California; including in areas prone to forest fires. The equation of too many homes located near areas that may burn quickly is a recipe for disaster if proper fire safety plans are not in place. Another piece of the California fire puzzle is earthquakes, as the potential for fire during an earthquake exists. No matter how good your fire safety plans, California-based or otherwise, you actually can't outwit a forest fire; the best you can do is be as prepared as possible. The first line of action during a fire is to protect your family and other neighbors also taking steps to prepare carefully even before a fire can occur. The biggest and best safety rule when it comes to California fire safety is to plan a "defensible space." Cal Fire has an excellent pdf brochure on how you should plan your home in relationship to the forest, including visuals. The basic gist of this is that your home should be defended by 100 feet of space all around. This is required by law in California. These 100 feet of space offers room for fire fighters to get in and do their job if needed and creates a buffer between your home and burning vegetation. At the very least 30 feet around a house should be completely clear of all vegetation which includes dried leaves and pine needles. Use fire defensive home building materials. Make sure street signs and home numbers are visible from the road - this is a big deal because sometimes homes surrounded by trees can become invisible to firefighters. Any flammables such as butane or propane need to be located 30 feet from the house. Make sure roads leading up to your house can accommodate two-way traffic and are clear of debris. Install fire resistant roofing and keep gutters free and clear. To learn much more about California specific fire safety planning visit CDF. Some steps toward great fire safety plans California-style are too big for the average homeowner to take on but there are some ideas they can push further into development or support actions for. In Canada, a recent experiment was conducted that involves an advanced satellite system called REMSAT (Real Time Emergency Management Via Satellite). While it can't prevent fires it can help firefighters tackle fires much more efficiently. A system like this could be wonderful for California. To read more about the project visit Telesat. Supporting the U.S. Forest Service is a smart idea as well. The Forest Service can actually create more fire resistant areas by pruning out smaller trees and dense under-tree growth. Clearing the right amount of vegetation can help prevent forest fires. Two-thirds of forest fires are accidentally set by human error. When you camp make sure your fires are out. Don't throw lit (or unlit for that matter) cigarettes out of your car windows and report suspicious activity in forest areas. Human action and proper planning can go far to prevent forest fires; even in California.